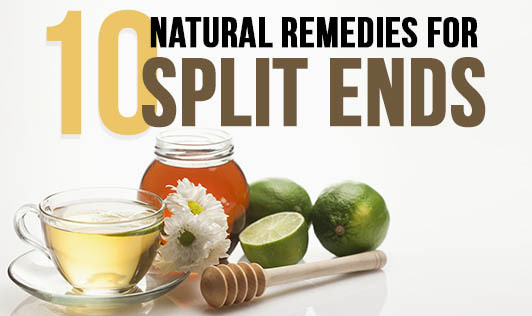 Split ends can be caused due to over washing of hair or from using very hot water for hair wash. It can also be a result of excessive exposure to dust, pollutants, sun, or chemicals in hair care products such as hair color, harsh shampoos, and conditioners. Another known cause is the frequent use of hair styling tools and products such as hair setters, curlers, and irons. Mix egg + olive oil + honey and apply it all over your hair as a mask. Wash that after 45 minutes. Mix olive oil + mustard oil + castor oil and wrap your head with a shower cap for 30 minutes before you wash it off. A spoonful honey + some curd can be used as a conditioner to apply on your hair ends for 15 minutes before you decide to rinse that thoroughly. Whisk a tablespoon of cream in half cup of milk and leave it on your hair for 15 minutes. Beer rinsing post a hair wash followed by a water rinse after two minutes can help treat your split ends and give your hair a great feel and shine. A warm coconut oil massage is nearly an answer to every hair issue. Ghee is a great remedy to have feel-good and problem-free hair. Keep it on overnight and rinse with warm water to take it off easily. Egg + honey + mashed ripe banana also makes for a good 1-hour hair mask. Fine fenugreek seed paste + curd for 30 minutes before a wash will give you silky smooth hair with great shine and no more split ends. Include plenty of protein, zinc, and vitamins C and vitamin E in your diet as well as the natural remedy preparations you make for your hair in order to prevent split ends and additionally maintain good hair health. It is always better to use a nylon hair brush, and brush your hair only when it is completely dry. Use cold or lukewarm water for hair wash to maintain good hair health.